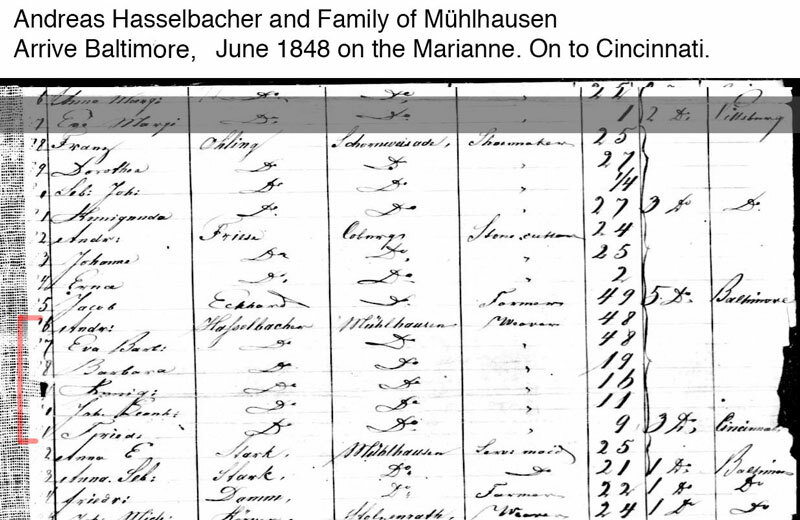 Here is another Hasselbacher family of Germany that came to America. I know almost nothing about them and hope someone will find this and contact me. The weaver Andreas Hasselbacher 48, his wife Eve Barbara 48, and their children Barbara 19, Kunigunda 16, Johann Leonhard? 11, and Frieda (?Friedrich) 9, arrive in Baltimore on June 1848. Their destination is Cincinnati. When I first wrote about this, I was not able to tell where in Germany this particular Mühlhausen was. (It is my observation, that Google Maps does not return as many options as they used to). Only two possible Mühlhausens in in Germany show up. One is in Thuringia near Schwarzberg- Shondershausen and the other is Mülhausen-Ehingen in the far south. Initially I did not know how to deal with this, but a lucky subsequent find places the Mühlhausen of Andreas Friedrich Hasselbacher squarely in the Aischgrund. Now we know exactly where this family came from. Below is an excerpt from the city archives of Bamberg. It tells of two Hasselbachers living in villages very close to each other and emigrating in 1848 and 1855. Once I would have said that it was a coincidence that I found this record, but it appeared to me as I was investigating the Hasselbachers of Vestenbergsgreuth. One piece of information attracts another! I now have four members of this family. Johann Andreas and Karolina on this page, and two Sophies elsewhere, one of whom comes to America in 1864. It is highly likely that all four are related to each other, but it is not at all clear that they are related to me. 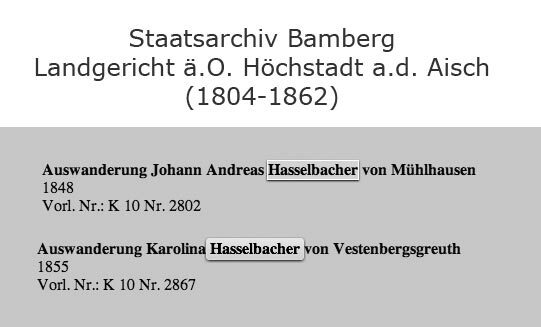 This may be the first Jewish Hasselbacher family that I have identified. The scientist in me does not like coincidence, but even though this family lived in the heartland of my Protestant refugee family from Austria, they may have come from an altogether different Exulanten. I do not know what happened to this family in either Germany or America. Some of the Germans likely did not survive the Holocaust. I have no other information in hand except this tantalizing census record of 1870 that places a widower Andrew of the right age in Terra Haute, Indiana. 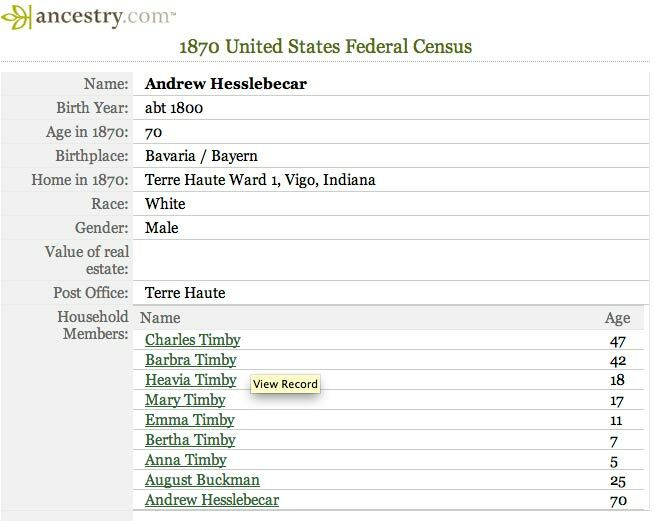 I have this census record and the spelling (or misspelling) of the name is certainly compatible with Hasselbacher. It seems possible that Andreas is living with his oldest daughter Barbara and her family. Another coincidence, and source of confusion to some, is that in 1872 another Andreas Friedrich Hasselbacher and his family emigrated from the Aischgrund to Cincinnati. That Christian family came from Diespeck and they are indeed my cousins. There may havebeen two Andrew Hasselbachers in Cincinnati in the 19th Century. Until March of 2011, I was aware of any living relative of the Cincinnati family from Diespeck. Now I know of several who found me through this website. Perhaps my Jewish family Hasselbacher will do the same. Peter Hasselbacher, 26 Dec 2010, edited 6 Jan 11; 16Aug11 Contact me.